Over the winter, I had fun making long-simmered pots of chicken paprika and goulash, Eastern European dishes that pull at my childhood memories. You see, my next-door neighbors growing up, an elderly couple from Poland the Kieslowskis, would often make these in their home and it filled my backyard with delicious scents as I scurried about in the yard, sometimes playing tetherball with my brother, sometimes helping my parents with yard chores like weeding, or sometimes wandering into the Kieslowskis’ own backyard to take a stealthy turn on their tree-hung swing. 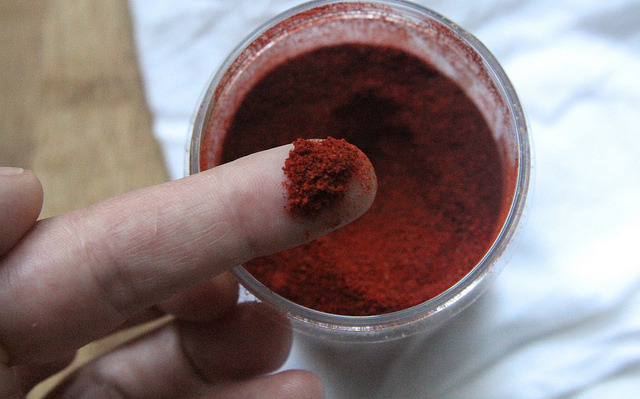 I liked the scent of bubbling paprika in a pot of proteins so much that whenever a waft of something like this tickles my nostrils I want to melt like a stewed chicken leg from its bone. So I don’t see why mussels need to be steamed with white wine and shallots (and/or the addition of cream or perhaps a touch of Dijon mustard) in the French tradition all the time. I love mussels and could probably eat a great, steamed pile of the aforementioned French preparations all the time if I had to. It seems that there is no need to mix things up. But I did, and was rewarded with a bright vermillion-stained pot of mussels and softened cubes of zucchini—a fairly good tradeoff, I must say now. 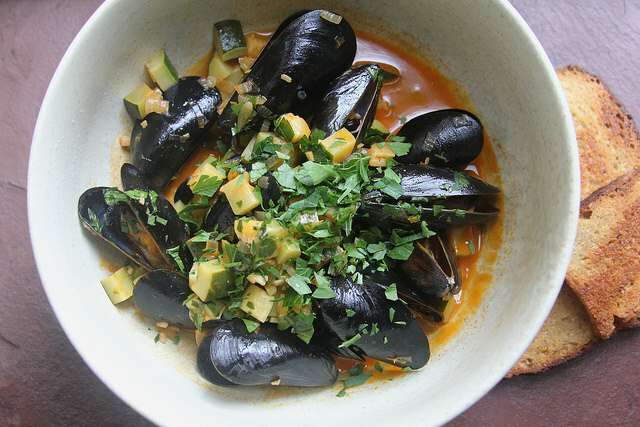 That’s really all you need to know about how to prepare this dish at home now, if you’ve ever steamed a pot of mussels before: Add some vibrant, smoky paprika and finely diced zucchini to the mussels before you cover it all and let the bivalves explode open. But if you haven’t steamed mussels too often at home (but love going to eat them, perhaps, in the French tradition at a restaurant), I have some extra-good news for you: mussels are incredibly easy to prepare, and incredibly cheap. Oh, and very sustainable, healthful sources of protein and valuable omega-3s. My friend Annaliese recently expounded on this eternal truth of mussels, and I can say for one that I’ve never paid more than $4/lb from any shop or place that sells mussels (usually cheaper, especially if you’re in New York and getting them from a Greenmarket vendor like Blue Moon Fish). 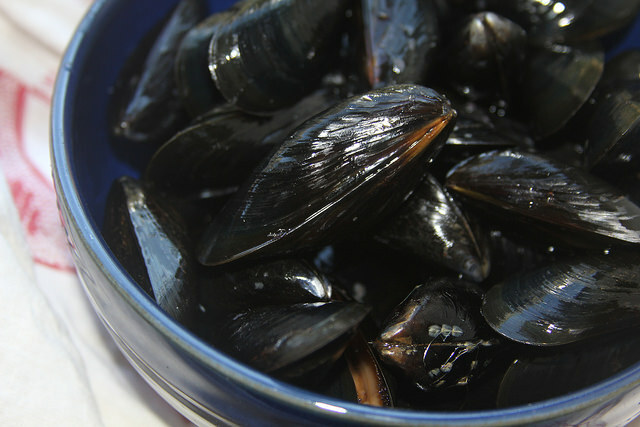 But in addition to replenishing you with good stuff, mussels also help clean the toxins of whatever waters they’re in, like most bivalves (oysters, for instance). These highly renewable farmed seafood might look a little dodgy to prepare at home—what with black, shiny shells that must be opened by heat, their inscrutable meats inside mysterious before then—they’re actually the easiest seafood to do right, in my opinion. They’re very thin-shelled, compared to most clams, and so letting them open with the help of some bubbling fluids in a pot takes a very short length of time. You do have to scrub and de-beard them, which is a task that is somewhat weird. But once you do it once or twice (like picking up dog poop), it gets to be second-nature, and well worth it for the happiness of having a dog or mussels on your plate. Mussels served just steamed open in their shells create natural spoons for scooping up broth and other goodies in the serving bowl. In addition to succulent red broth created with the help of paprika, I added some chopped zucchini, because it was just in season from my CSA. You could add just-picked tomatoes, just-scraped kernels of sweet corn, sweet peppers, and any kind of summer squash in the manner of the zucchini found here. Whatever you want to slurp into your mouth from those shiny black shells should work. 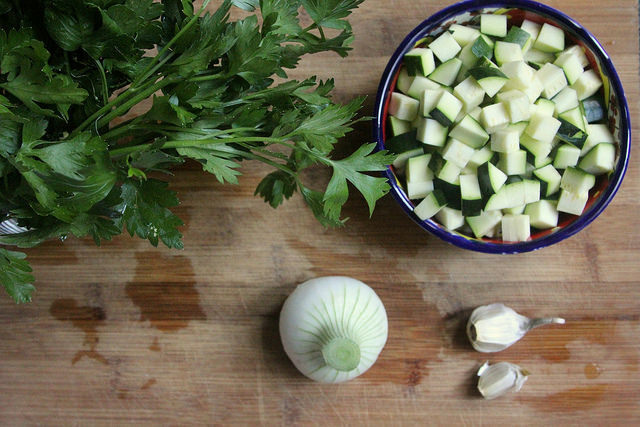 But I really like how the cubes of zucchini completely absorbs the broth like little sponges. Why not add more vegetables to a classic dish? I’m not sure if the Kieslowskis would have ever initiated this in their kitchen. But I have a feeling that if they’d tried it in mine—or wandered into my backyard today—they might approve. Rinse and scrub the mussels under cold water. Pull the “beards” (those hairy-looking grey strands) from each one and rinse. Heat the oil and chopped onion over low heat in a large pot with a lid. Once softened, 5-6 minutes, add the garlic and paprika. Stir over low heat another minute. Increase heat and add the wine. Bring to just a boil, then add in the butter, zucchini and mussels. Close the lid and let steam for 3-4 minutes. Check to see if all the mussels have opened; if they have, transfer everything to a serving bowl and shower with the fresh parsley on top. Serve immediately, with crusty bread for dipping. Three brownie points: People once pointed to shellfish as something to eat in moderation because it contains a lot of cholesterol. Nowadays, we embrace shellfish and seafood because it contains omega-3 fatty acids, a beneficial fat that Americans don’t seem to get enough of in our diets. Whichever nutrition fashion you favor, there’s no denying that mussels are complex critters with a lot of things going for them—and mostly good. In addition to protein and omega-3’s, B-vitamins, and many other vitamins and minerals like iron, zinc and potassium. Adding fresh, barely-steamed zucchini to this pot only makes it more healthful, giving you more vitamins and fiber while adding appealing chunks of contrast to the broth. 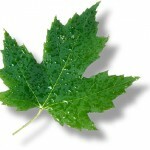 Eight maple leaves: Farmed mussels are one of the most sustainable seafoods you can buy, according to Seafood Watch. They’re highly renewable and help purify their environment. In addition to mussels, this dish has zucchini, which is just in season and will soon become way too plentiful on farms (or in your garden) right about now. Eat them up! Wow, this recipe looks amazing!! I really can’t wait to try it, thank you for sharing the details! This is just too good. Thank you for the awesome info. This one is looking so good intaste i am looking forward for have this dish. 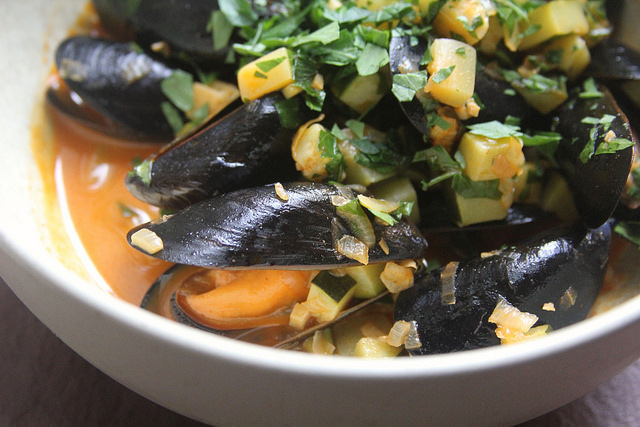 I really like mussels, gotta try this recipe soon!! Thank you for sharing! 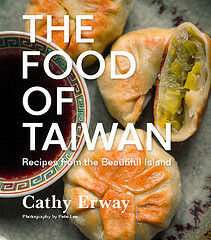 Thank you for this article especially the recipe.